A beautiful day in the neighborhood before we heat up again. 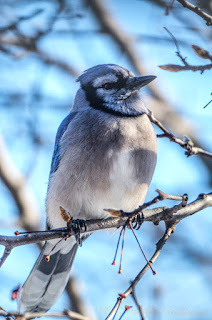 My image is of a colder day but one of the best Blue Jay shots I have ever been able to get. It was at the in-laws home and out their window. It sat for a bit fairly close and posed so nicely for me. They usually are moving around quite a bit and looking for food. I got quite lucky with this one.